Our best selling Absco Gable Roof Double Carport incorporates triple web trusses for maximum strength, durability and stability and based on solid steel construction. 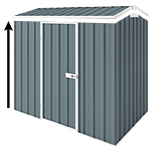 Engineered to W41 Wind Rating as standard and can be upgraded to W50. The standard height is 2.25m that can also be increased to 2.85m.